High quality gift pack increases retail presence. The competition for promotional space during the holidays is fierce. That’s why the Templeton Rye distributor turned to Westamerica for a creative solution leading up to the important holiday sell-in period. The distributor was looking for a way to marry multiple products together for a holiday gift promotion. Westamerica’s engineers found that less can be more then it comes to packaging, and designed a gift pack that incorporated recipes and other necessary information while keeping the focus on the product and quality. 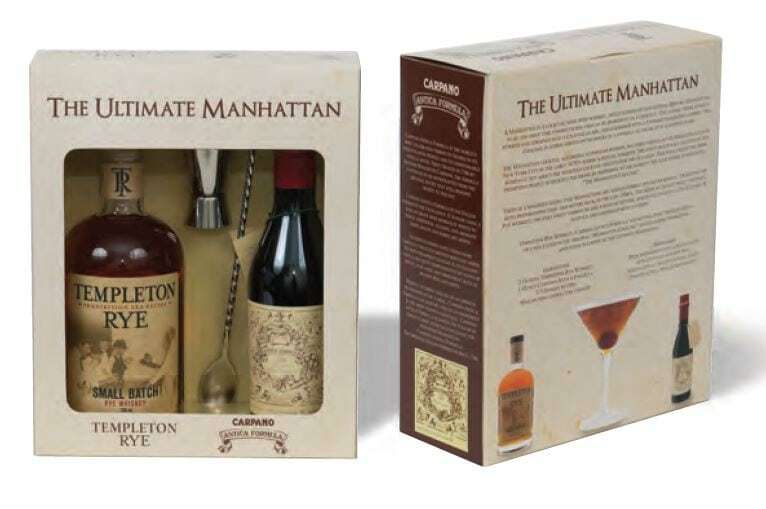 The gift pack featured their Templeton Rye Small Batch Whiskey and a popular brand of vermouth. To lower shipping costs and increase store presence, unique display cases were designed directly into the product shippers! The result was a handsome gift package that displayed nicely in-store and generated increased revenue and profit.